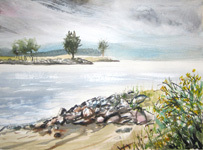 From 1982 – 1993 Lynn worked in watercolour painting, collage, and ceramic sculpture. During this period she produced art for several exhibitions and executed commissions for large ceramic sculptures. From 1982 to 1987, she worked mainly in ceramic sculpture. Lynn was born on February 24th in Brantford, Ontario to Mary Burrows and Toni Onley. Both of her parents were artists who studied at the Doon School of Fine Arts under Varley. Her father immigrated from the Isle of Man with his family when he was nineteen. Tragedy struck and her mother suddenly died when she was two and a half. Her mother was only twenty three. As a young child, Lynn spent three years in Mexico (San Miguel de Allende) as her father had a scholarship to study there. This left a deep impression on her. Later on these images of her vibrant life there continued to emerge in her ceramics and sculpture. She returned to Mexico as a student to study Mayan history. In the years to come, it was evident that Lynn had the same driving force as her parents to create art. She began her formal training at Capilano College, the Vancouver School of Art, then finishing at Emily Carr College of Art in 1982. While drawing is something Lynn always pursued, she was inspired by many media, and at the time, sculpture was her passion. In Lynn’s mid-thirties she began regularly flying and painting with her father. These treasured times were filled with adventure when going to beautiful and remote BC locations in her dad’s flying boat. Although her dad had a great sense of humour, the compliments from him did not come easily. If it was good it was good. He trained her to really look. Now she has a critical eye and can see if a composition works. He was a wonderful teacher. Lynn misses her mentor and dad. It’s true that one lives on in their art. It always remains fresh. That is the beauty of creativity.